Sarah and Asiya invited many to share their Eid dishes. What is Eid you ask?. Eid is the feast a great holiday for Muslims around the world, it is something like Christmas but is not related to the birth of prophet Mohamed. Actually we have two Eids, Eid-Al-Fitr which follows the holy month of Ramadan – coming in 3 days- and Eid-Al-Adha which follows the pilgrimage days and both are lunar based days of course which means they move around the Georgian calendar. 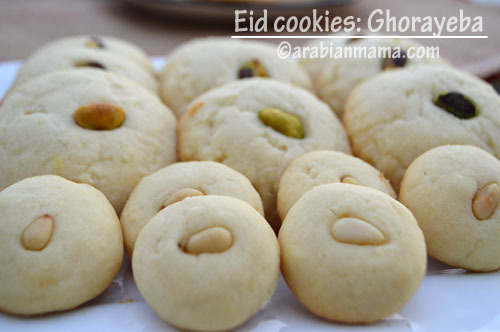 The most common dishes in Eid-Al-Fitr are fish dishes and cookies, so so many cookies, like Kahk, Betefour and today I am showing you a new kind called Ghorayeba. When I was young I did not like that kind of cookies as it was ” too buttery for me”, can you imagine how miserable I was :). Now after growing up and knowing that butter is one of life’s many wonderful things, I started to like them. 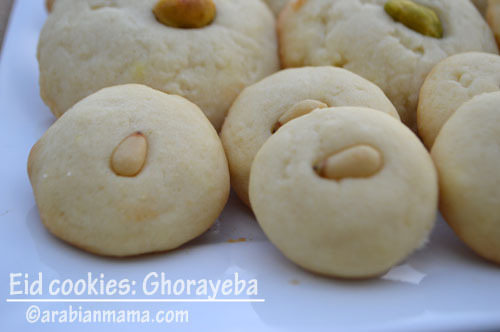 Ghorayeba cookies are very easy to make, they should be baked until just done but not to be browned, they should comes out still white. They are so fragile so be careful when handling and presenting them. They store very well, up to two weeks. Ghorayeba comes in many different shapes but the above shape is the most common one. Sometimes the dough is placed in a piping bag and piped into a crescent shape or full circle. It is usually topped with pistachios or pine nuts and sometimes topped with candied edibles like sugar pearls. Here is a video on how to make Ghorayeba on my You Tube channel. 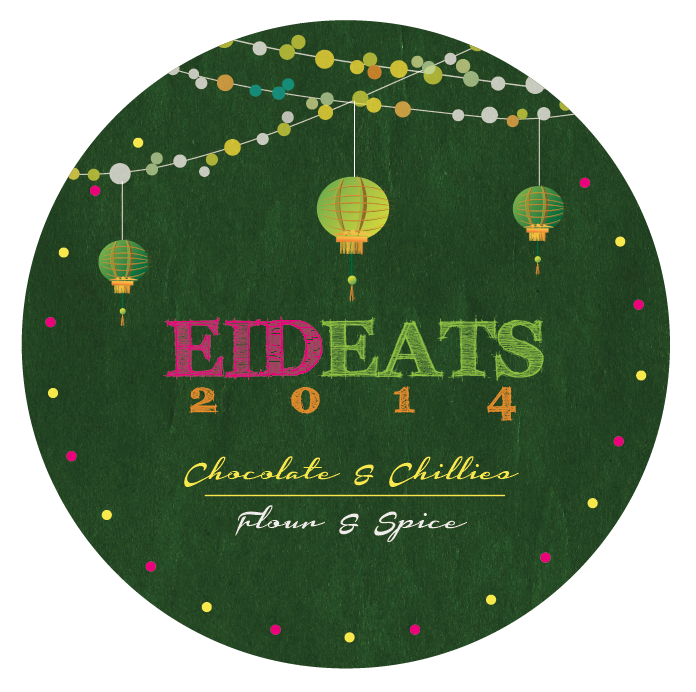 Happy Eid to all of those celebrating it … Enjoy. 1 1/4 cup of unsalted butter- room temperature. 2 cups of all purpose flour. 1/2 cup of corn starch. 1/4 tsp powdered vanilla or 1/2 pure vanilla extract. 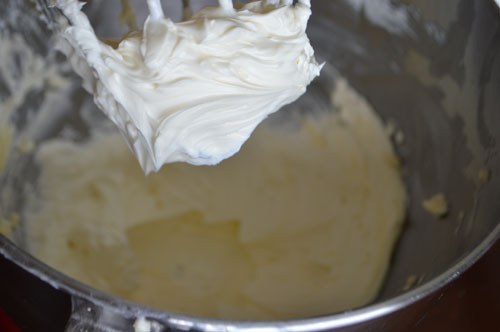 Start by creaming butter and sugar until you get a smooth white mixture- about 3 minutes. Then add the egg, vanilla and mix well. 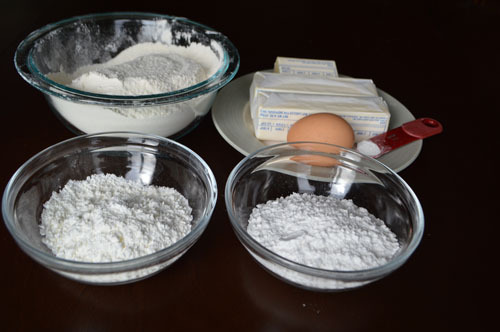 Add the flour,cornstarch and baking powder and beat just until incorporated. Cover and refrigerate the batter for an hour or two, or until firm. When batter is firm, form into balls, to make sure the balls are all the same size I’ve used a measuring spoon lined with plastic wrap. I’ve used the 2Tbs measuring spoon but the balls turned out to be jumbo Ghorayeba 🙂 so instead I guess a 1 Tbs measuring spoon will be enough. 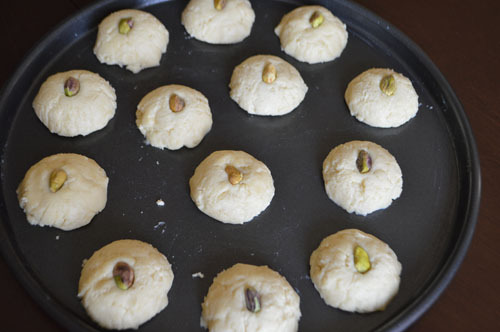 Place in baking sheet and top with one pine nut / pistachio or sugar pearls. Bake in a 350F oven for 15-20 minutes or until the edges just start to brown. 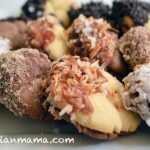 I’ve made bite sized ones with pine nuts, they were delicious and my kids loved them so much I hope you will too. 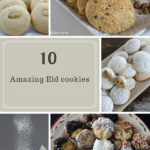 I just made these for the first time as it is one of my husband’s favorite eid cookies. But they melted into one big piece in the oven. I followed the recipe but converted into kilograms as we don’t use cup in Denmark. What do you think went wrong? Camilla, sorry that this happened to your ghorayeba. This is really strange as the ratio of fat to dry ingredients in this recipe is very moderate compared to other recipes for ghorayebah. The only possible reason I can think of is the oven temperature, try making a small patch and lower the temperature to 325 or even 300 and bake longer. Also there is a trick we always use – but I did not use this time- is to chill the dough for several hours or may be even overnight in the fridge before baking and make sure that your cookie pans has cooled down before baking the next patch. Let me know what happened. 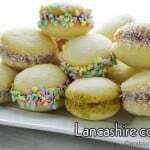 They are the perfect afternoon snack to have with coffee or tea.